Milk still delivered whatever the weather!! Jack Umfreville on the right hand window worrying how he was going to deliver his milk!! 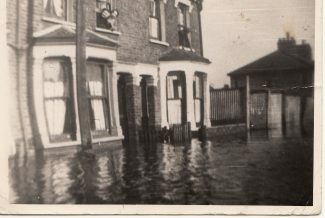 The picture was taken in Christchurch road in the 1953 floods. The left hand window shows the Bynes ( if I remember correctly) family looking out the window. The next window on the right show my dad Jack Umfreville who had a diary looking out the window worrying about how he was going to deliver the milk that morning!! He managed to get a rowing boat and delivered the milk to everyone by boat! He usually used a horse and cart and the horse’s name was Dolly. He told me that after his rounds delivering the milk, he would be tired so put his feet up, lay back and have a sleep. Dolly the horse would then trot him all the way home! !